A century from Samit Patel helped propel Notts Outlaws into the automatic qualifying positions in the North group of the Royal London One-Day Cup. Patel scored an unbeaten 103, getting his runs from 104 balls with 11 fours and two sixes, as Notts defeated Lancashire Lightning by seven wickets at Trent Bridge. The 32-year old was joined in an unbroken fourth wicket stand of 183 by Steven Mullaney that spanned 28.3 overs. Mullaney finished on 77 not out, with four fours and four sixes, as Notts chased down a victory target of 261 to win with 24 balls to spare. Earlier, Lancashire scored 260 for six after winning the toss and opting to bat first. They lost their way somewhat after a fine opening stand of 98 and were indebted to Haseeb Hameed’s unbeaten 75, which held the innings together. Mullaney, with two for 31, was the pick of the home attack, although Australian international James Pattinson, two for 38, altered the course of the contest with his initial, fiery burst. 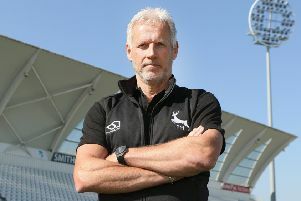 Notts had lost their three previous one-day matches at Trent Bridge but overcame the early loss of Alex Hales to successfully chase down a sub-par target. Hales followed up Thursday evening’s century against Durham with a quick exit as he tamely helped James Anderson into the hands of Stephen Parry at mid-on. Danny Lamb, a 21-year old medium pacer making his debut, experienced a harsh introduction to first-team action as Michael Lumb despatched his second delivery into the stands. The young seamer from Preston bounced back in style, bowling Riki Wessels for 25 before having Lumb, who made 47, caught at mid-on. Mullany and Patel both gave difficult caught-and-bowled opportunities as they looked to rebuild the innings, with Parry spilling Mullaney on 11 and then the ball just wouldn’t stick in Anderson’s out-stretched right hand as Patel drilled the ball back towards him. Patel reached his 50 from 60 balls and his partner got there from one fewer, reaching the landmark with an enormous six off Stephen Croft. As the finishing line came into sight both batsmen began to find the ropes with increasing regularity and Mullaney’s fourth maximum, off Parry, settled the contest. At the start of the day Lancashire’s openers made the most of friendly batting conditions to put on 98 in 17 overs before both fell in quick succession. Karl Brown had just brought up his third 50 of this season’s competition, getting there from 54 balls, when he pushed hard at Stuart Broad and picked out the safe hands of Patel at extra cover. Alex Davies made 45 before being knocked off his feet by an explosive yorker from Pattinson, which thudded into his boot and gained a positive leg before verdict from umpire Baldwin. Pattinson’s pace also accounted for Liam Livingstone, who had a brief and frenetic stay at the crease before nicking behind. The catch was Chris Read’s 258th one-day catch for Notts, a county record, taking him past Bruce French’s tally. Mullaney, playing against his first county, bowled a miserly spell from the Radcliffe Road End that tempted Dane Vilas to hit straight to mid-off and then he knocked back Steven Croft’s middle-stick. Ryan McLaren made 42, during which he struck Patel away for the only six of the Lancashire innings, but he then lost his middle stump, to become Harry Gurney’s 100th one-day victim. Twenty-year old Hameed improvised to good effect towards the back end of the innings, hitting five fours in his 79-ball undefeated knock. Lightning’s acceleration possibly came a few overs too late and in the end they were well short as Notts clinched victory with four overs to spare. Notts Outlaws travel to Northants on Tuesday, knowing that victory will guarantee their spot in the qualifying phase. Lancashire finish their programme away at Durham on the same evening and must win and hope other results go their way.